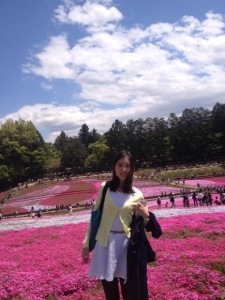 On May 2nd, I visited the famous shiba-zakura (芝桜) park in Chichibu city（秩父市）, Saitama prefecture（埼玉県）. Shiba-Zakura (芝桜) season comes around mid April till mid June, a bit after the sakura season. 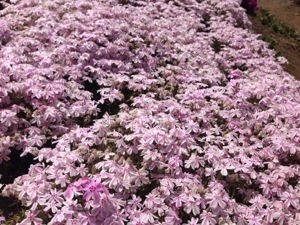 Shiba-zakura is called moss phlox in English. It is a plant that is similar to shrub-type plants which grows to a height of about 10 centimeters with long leaves and small vividly pinkish flowers. Due to its appearance that is similar to cherry blossom, it has been called ‘shiba-zakura’. I have never seen shiba-zakura before but I have heard wonderful things about it, so I decided to visit the nearest park to Tokyo in Golden Week. 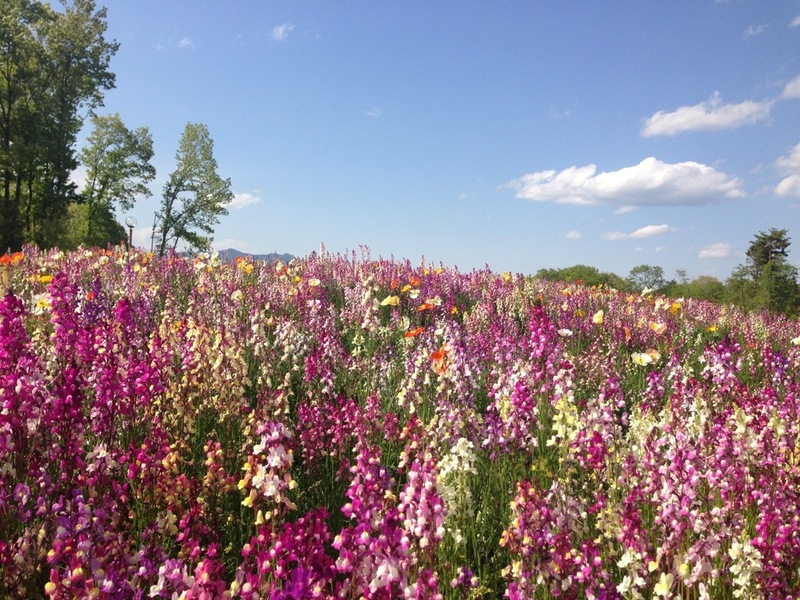 Chichibu city (秩父市) is located in the Northeast of Saitama prefecture（埼玉県）, a neighbor prefecture of Tokyo. It is famous for shrines and nature especially for outdoor activities such as flower viewing, picnic, barbecue and strawberry picking. There are also many festivals such as Chichibu night festival in which decorated floats are lighted up at night in a shrine. There was a festival on the day I went as well but time was limited so I couldn’t stay long enough to see. The easiest way to get to Chichibu is by train from Ikebukuro station. I took Seibu-ikebukuro line （西武池袋線）from Ikebukuro station　（池袋駅） to Seibu-chichibu station　（西武秩父駅). The trip took about 1 hour and 45 minutes. Apparently, there are express trains as well but the tickets were all sold out for the day due to the amount of people visiting during holidays. So, make sure you get the tickets beforehand if you plan to go on holidays. 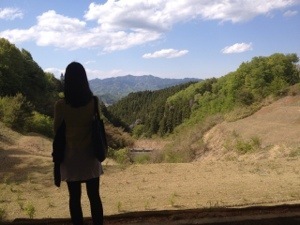 One of the things I love most about Japan is that Japan has a way to make nature very attractive and Japanese people sure know how to appreciate it. They create an event out of what is around and make everything exciting. All year round, there are always new events, things to see and places to explore. 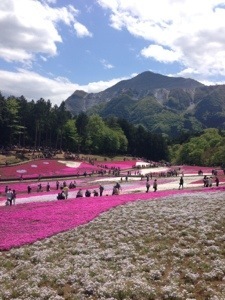 It is obvious that this shiba-zakura flower field was well designed and surely has become a great tourist spot out of the wonderful nature. It is just very impressive. 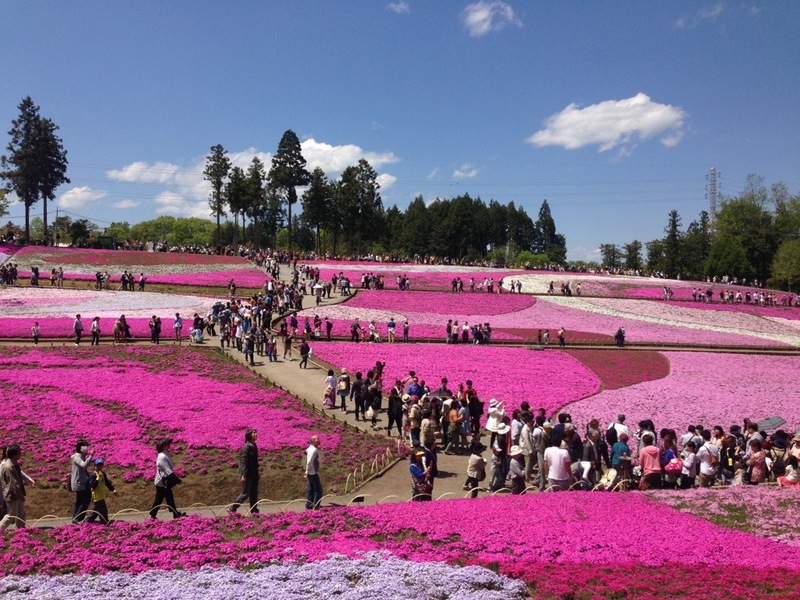 In Japan, people definitely have a great sense of beauty. 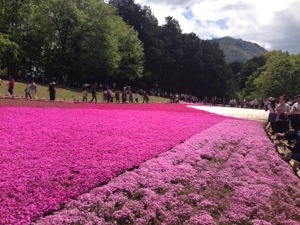 Shiba-zakura festival near Mount Fuji -> http://www.shibazakura.jp/ （Japanese), News in English -> click here! 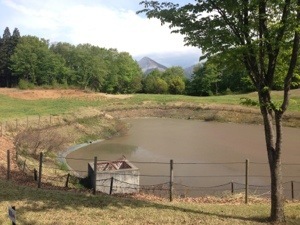 Other than Hitsujiyama Park, there are also other places in Chichibu city. 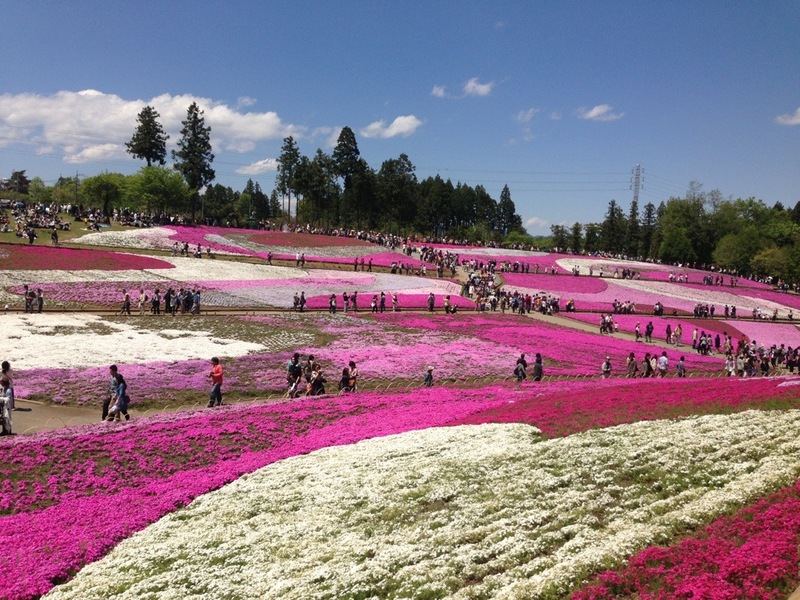 I got to visit another park called Chichibu Muse park （秩父ミューズパーク）which is famous for poppies. I took a free shuttle bus from Hitsujiyama park to Muse park and a free shuttle bus to Chichibu station before heading back to Tokyo. 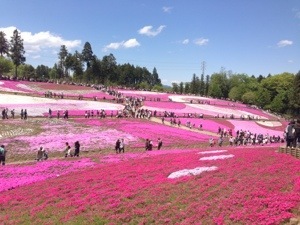 However, this time the poppies were not in full bloom yet, so we got 50% discount for our tickets. Despite not being to view the poppies, the park was beautiful. I could see different kinds of flowers which I don’t know what they are but it really didn’t matter since everything was beautiful. I also found a small two-storied stadium on top of the mountain where we can see scenic mountain views. The scenery was breathtaking.